The Guangzhou Cremona Company, an award-winning company founded in 1989, is renowned for making high quality stringed instruments and bows that are well suited for beginners. Cremona violins have excellent playability and quality for their price tags, making them a popular choice for beginners. This is why we have created this list of the top 5 Cremona violins for 2019. Cremona makes quality instruments affordable, especially in outfits that come equipped with a case, bow, and quality D’Addario strings. Cremona violins are made with top quality wood, many of which feature beautiful flamed maples, which add a lot of resale value to the instruments if you ever feel ready for an upgrade. Though take this list with the following caveat: You should never buy an instrument based solely on its brand name. Each instrument under a label is different; you should try to play the violin before you make a purchase – or at least have a 100% guarantee that you can return the instrument if you are not satisfied with the quality or tone. With the amount of variance in the construction of violins, expensive does not always equate to excellent, so use your ears as your best guide to the right violin for you or your child. If you are buying a violin for the first time, it is highly recommended that a violin teacher or experienced violinist help you make your purchase. With a Cremona outfit, you will have all of the tools you need to start making music right away. As an outfit, the Cremona Débutte comes with a lightweight violin case, D’Addario Prelude strings, and a J. La Salle Brazil wood bow. Each violin meets the recommended educational specifications and is adjusted in the shop before your purchase. Available from 1/10 size all the way up to 4/4, the Débutte can help you get your start on the instrument, no matter your age. For a step up from the basic beginner instrument, consider the Cremona Cannzona. The Cannzona is more easily personalized as you or your child develops and needs an instrument compatible for your or their playing style. The Cannzona is fitted with rosewood pegs and tailpiece, as well as an ebony fingerboard. As an outfit, the Cremona Cannzona comes with a lightweight case and quality brazilwood bow. With a beautifully flamed maple back, you will look and sound great with the Cremona Cannzona violin. It is available in an outfit from 1/32 to full size. The SV-500 is a good choice for anyone looking for a first or second violin. It’s an excellent instrument for those who are intermediate students or serious beginners. The SV-500 features a clear, smooth, and bright tone and is available from 1/4 size to 4/4 size. The SV-500 is made out of top quality tone woods, a spruce top with a beautiful flamed maple back and sides. It is fitted with Swiss-style ebony fittings and fingerboard with a composite tailpiece with four fine tuners. In an outfit, the Cremona SV-500 comes with a lightweight, padded oblong case and a brazilwood or pernambuco bow. With the SV-500 you are guaranteed an excellent instrument, it’s easily one of the best intermediate violins on the market. Each violin is set up in the Cremona workshop in California up to the Music Educators National Conference (or MENC) standards for educational use. With an improved feel and tone, the Cremona SV-600 is a definite step up from the SV-500 model. 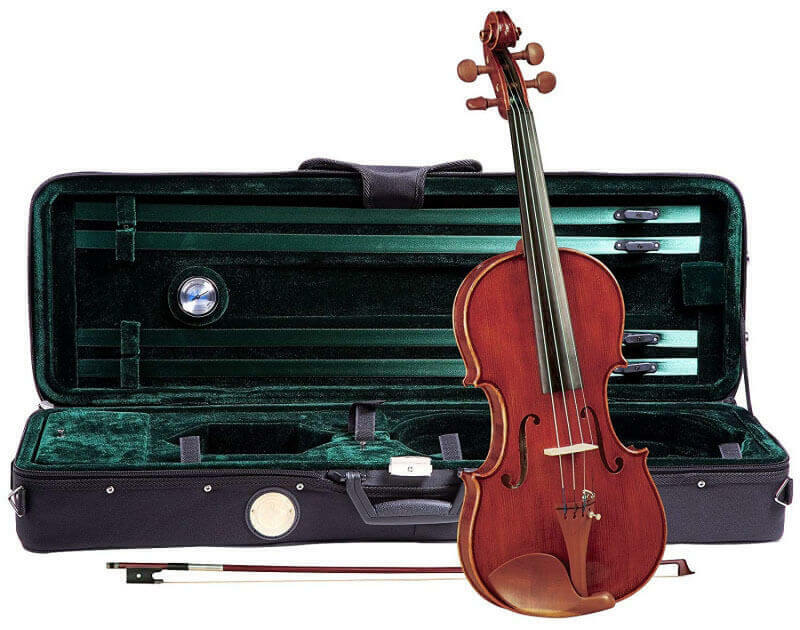 We recommend the SV-600 model for intermediate violinists who are serious about progressing on the instrument. The Cremona SV-600 has quality ebony fittings and fingerboard and comes equipped with Dominant strings, high-quality violin strings made by Thomastik Infeld, and an Aubert bridge made in France. This instrument features hand crafted inlaid purfling for the spruce top to prevent the wood from splitting at the edges, as well as beautiful flamed maple for the back, sides, neck, and scroll, which greatly increases the value of the instrument. As usual, the outfit includes a lightweight, top-quality oblong violin case and matching blanket with either a brazilwood or higher quality pernambuco bow. You can be confident in the quality and playability of this instrument. Like the SV-500, the Cremona SV-600 is set up in their California workshop to the Music Educators National Conference (or MENC) standards for educational use. The Cremona SV-1220 rounds out our list as the priciest, but highest-quality model. Hand carved from the highest quality aged, fine-grained spruce and select flamed maple, the SV-1220 is a good intermediate to advanced violin outfit with a high resale value and an ever better tone for its price. With hand crafted inlaid purfling and a high quality oil varnish applied by hand, the SV-1220 is a well-made instrument that can put up with day-to-day wear and tear. These instruments are produced in smaller workshops instead of factories, and this individual attention to detail certainly shows up in both the material quality and aural quality of the violin. Fitted with the best hardwoods, Hill-style boxwood pegs and a top quality ebony fingerboard, Cremona Maestro violins will be able to support you to the next level of playing. In an outfit, the SV-1220 is strung with VNS-150 Perlon strings and comes with a J. La Salle Brazil wood bow and a deluxe Travelite suspension case. The Cremona SV-1220 is available from 1/4 to 4/4 sizes. If you are a more advanced player, impressed with the quality of Cremona violins and willing to invest a bit more in an instrument, be sure to check out Cremona’s Replicated Violin Series of Cremonese violins made in the seventeenth and eighteenth centuries. Violins in this series include the Giuseppe Guarneri ‘del Gesù’ Kreisler 1730, and Heifetz 1740.